17 | November | 2014 | Coyote Moon, Inc. If you happen to live in a location where every neighbor has a Wi-Fi network (or in some cases, more than one), then you know Wi-Fi congestion can cause problems. 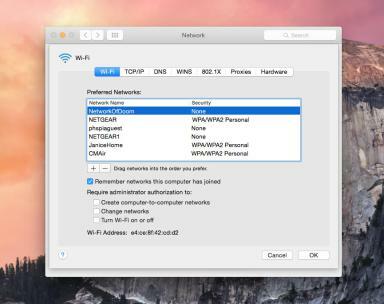 Unless you’re planning to move to the countryside, where your neighbors won’t be within shouting distance, you’ll probably need to control your Mac’s attempts to connect to local Wi-Fi networks. One feature of OS X’s wireless networking system that I routinely take advantage of is its ability to automatically connect to the strongest non-secure network in the area. This is a great help when I’m traveling and need Internet access at a hotel, coffee shop, airport, or other location. Most of the time, when I boot up my MacBook, I’m already connected to a Wi-Fi service. While it’s usually a guest network that may require a password, at least the basic connection is already established. When you travel, you’ll probably find this auto connect feature very helpful, too, but what about when you’re home, and there are multiple Wi-Fi networks in your area? Once Wi-Fi congestion rears its ugly head, that automatic connection system can be more of an inconvenience than a help. After all, you probably don’t want to connect to the NetworkOfDoom, or JaniceHome, or even NETGEAR, NETGEAR1, or NETGEAR2. No, it’s your own home network that should be your preferred network, and your Mac should be able to make the connection automatically, even when a neighbor’s network has a stronger signal.